Dairy Queen debuts the new M&M's Peanut Butter Monster Cookie Blizzard as their Blizzard of the Month for July 2016. 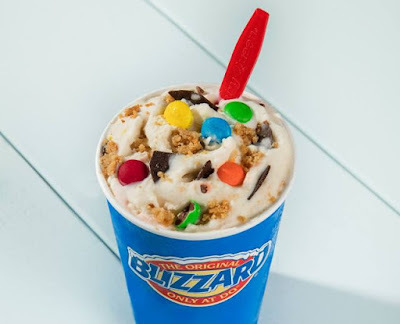 The Blizzard features M&M's, creamy peanut butter, choco chunks, and peanut butter cookie pieces blended into vanilla soft serve. The chain is also featuring the Peanut Butter Cookie Dough Smash Blizzard Cake this month. It features peanut butter cookies, chocolate chip cookie dough, peanut butter, and choco chunks layered with vanilla soft serve.